Forgive the delay between this post and my last. Readjusting to my relentlessly fast-paced, action-packed New York lifestyle has required me to briefly avert my attention from blogging, but I have an announcement that I believe will instill in my readers joy to sufficient compensate for whatever feelings of neglect they may have suffered on my account. As many have come to know through experience, deep sadness can oftentimes compel one to, in desperation to distract oneself from the source of that sadness, enact somewhat impulsive behavior. Though said compulsion most commonly manifests as binge drinking, regrettable sexual misadventures, or some combination thereof, those afflicted, even when of a perfectly contented disposition, by a profound lack of responsibility in regard to the management of fiscal assets, such as that one must possess in order to judge the purchase of the domain name ‘omgabat.com’ to be a good idea, are often susceptible to inducement by sorrow to carry out exorbitant monetary expenditures. 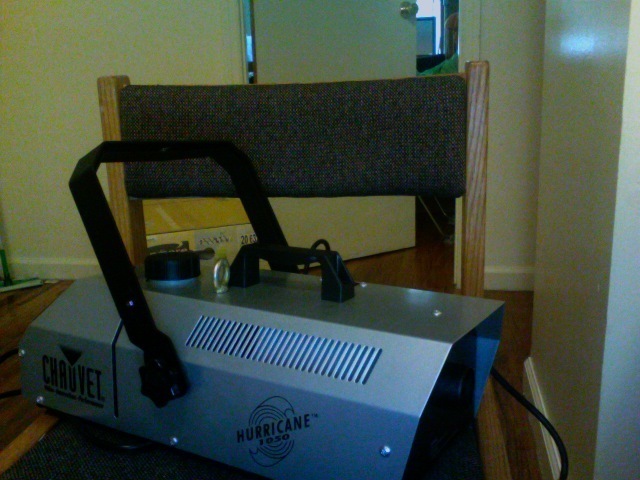 There exists perhaps no evidence that better legitimizes the latter idea than that represented by the 200 dollar fog machine presently sitting on a chair in the 7’x7′ chamber I generously call my kitchen. This glorious device possesses a 1,000 watt heater, allowing it to be primed for fog production, which it carries out at a nigh-unbelievable rate of 5,000 cubic feet per minute, almost immediately after activation, and a 1.4 watt tank, along with a warning light that signals impending fuel depletion, ensures all but perpetual function. Unfortunately, despite these impressive capacities, the utility of even such an masterful work of engineering within the context of my life is almost entirely nil. Thus far, I have been unable to cogitate a use to which The Hurricane might be turned, beyond providing atmospherics for a kickin’ party, encapsulating the entire effects budget for a mid-20th century British Horror Film, or the blasting of fog into the faces of new acquaintances into order decrease even further the rate at which I make friends. Undaunted by the unshakeable sensation that I may have dedicated my resources to a somewhat reckless end, I am resolved to not relent, and to reflect, a year from now, on the day I bought my fog machine with minimal regret. Any willing to offer suggestions as to how I might achieve this goal would earn my gratitude. Remember what I said yesterday about financial responsibility? Roughly 24 hours and 15 dollars later, I am officially the owner of OMGABAT.com. I figure this is excusable as I don’t smoke, and am therefore entitled to spend money more liberally than those who maintain such an expensive habit. Nevertheless, I am not totally at ease, for somehow when I type OMGABAT.com into google, the search engine incorrectly informs me that no such domain exists, which complication is interfering in my ability to fully enjoy this purchase. I would greatly appreciate any insight into the source of and possible solutions to this vexing problem.